Guest Post from Tom Williams: Who is Susan? Posted by Jenny Kane on Apr 15th, 2016 in Blog, Fiction, Historical fiction | Comments Off on Guest Post from Tom Williams: Who is Susan? I’m delighted to welcome Tom Williams back to my site today to talk about his latest book, and a young woman called Susan! 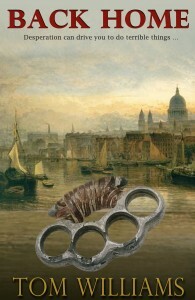 My books are a simple history of a man who finds his best friend has fallen in with villains in 1859 London. Admittedly his attempts to save his friend end up in all sorts of adventures with spies and crooks and fights with the police and much underhand business…Then again, there is the story of young Susan. Susan has been recruited to help our narrator, John Williamson, who has been recruited to pass off bad sovereigns – a much more difficult part of the business of making money by forgery than the manufacture of the coins in the first place, which was practically a cottage industry in 1859. Susan, when I met her, did indeed seem a nice enough girl. Her father had been a baker, but on his decease (‘Just upped and died’, she told me, ‘on a Tuesday, just after he opened the shop,’) her mother had been unable to make the place pay. The family had got into debt and Susan had left for the Metropolis in the hope of repairing her fortunes, but, like so many other young girls, she had fallen in with bad company and, being desperate for money and having no reputation left to preserve, she had turned to selling her body to survive. Susan still had a little of the bloom of the country on her, though she was already developing a certain hardness in her features which seems common to women who make their money as she did. Still, once Michael and I had dressed her up in clothes that we purchased especially for the business at hand, she could pass as respectable. 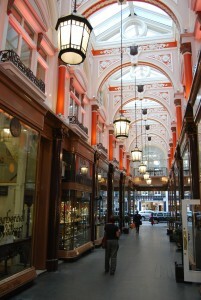 Our first foray was made that afternoon to the Burlington Arcade. Michael assured me that my companion’s appearance would be entirely unremarked there. So, having dressed myself in my smartest suit, I repaired to Piccadilly with her on my arm. Despite the new outfit, the girl could not but look what she was and anyone watching our progress through the West End would see a gentleman with his poll. This was a role that, given my nature, was one that I had never played before. I must admit that, in anticipation, I had believed that I would be mortified with embarrassment, and was uncertain that I would be able to pull it off, but, in the event, I found myself but one of many promenading with a woman clearly not my wife. Indeed, once I had opened my eyes to what was going on around me, it seemed that the Burlington Arcade was as rife with vice as Seven Dials – but in the Arcade the women were much better dressed and the signs of pox less immediately visible. Accompanied by this woman, it seemed natural that we would find ourselves loitering in front of a jeweller’s window. She pointed enthusiastically at the display, while I made as if I were anxious to be off down the street. Once I was sure that our dumb show had been noticed by the staff inside the shop – one of whom, I could swear, was trying unsuccessfully to hide his smile – I shrugged resignedly and went in alone, pointedly leaving my companion outside. With every appearance of embarrassment and awkwardness, which required little in the way of acting on my part, I indicated that I wanted a small bracelet from the window display. I had carefully chosen an item that might reasonably be purchased with ready money. The assistant picked it from the window and, without being asked, made it up into a neatly wrapped packet. ‘Sir will be taking his purchase with him?’ he asked, struggling to conceal his smirk. I reached into my pocket and withdrew three golden coins and three (real) shillings, which I slapped onto the counter, grabbing at my parcel and heading toward the door. The assistant was clearly amused and watched as I hastened towards my lady friend and passed her the package. She immediately threw her arms around me and, from the corner of my eye, I saw the shop man, his eyes glued to this indecorous display, toss the coins into a drawer without any proper examination at all. 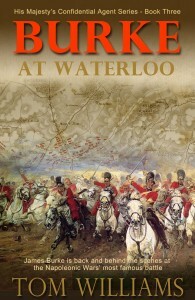 After a lifetime of respectability, writing research reports for government and management, Tom now writes historical novels. 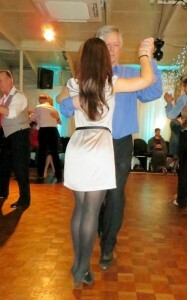 He is a man of spotless integrity, whose greatest vice is occasionally dancing tango with women who are not his wife. Many thanks Tom- another great blog.